Home / Uncategorized / Is it time we Networked more? Did you participate in Al Gore’s Climate Reality Project last week? I wasn’t able to because I was working in Ethiopia (my next post will tell you why), so I’ve been reading up on responses from participants, some of whom have questioned whether he was right to try to use social networks like twitter and facebook to raise knowledge about climate change. Personally, I think using social media is fantastic, but I also think that sometimes, good old-fashioned face-to-face networking is great. Two weeks ago, I was sat in a room with 70 other development economists from all over the world. 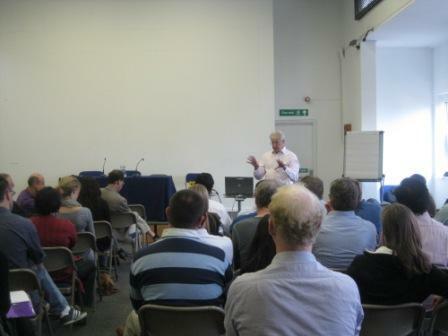 We were in that room to take part in DFID’s annual three-day economists’ conference in London. It was a special conference, as it was the last that our Chief Economist, Alan Winters, would attend in that capacity (NB: Alan will continue his esteemed contributions to economics at the University of Sussex). The conference included a series of high-level speakers, workshops on key tools that DFID economists use, and lots of case studies to share experiences and challenge ideas. We invited the inspiring Lucy Marcus to give us her lessons on encouraging innovation while managing risks of failure. Justin Lin, the World Bank’s Chief Economist (and fellow blogger) also joined us, arguing that economists have wrongly minimised government’s role in the past. I even made a short presentation on green growth to colleagues – which you can find here (please do read the notes). I told them that best part of being in DFID was exemplified by the room they were in – the fact that DFID invests in knowledge and professionalism. One in three DFID staff has a specialism that is nurtured and cherished, such as economics, evaluation, environment, health care or governance. Other government departments I’ve worked in over the years don’t have anywhere near as strong a knowledge-based culture. This culture doesn’t just make DFID a great place to work; it also makes DFID’s advice hugely respected at home and abroad – as suggested by the Center for Global Development’s ranking of the quality of aid from 31 bilateral and multilateral donors and Action Aid’s new report on “real aid”. The good news is that DFID is starting to network more and more with other government departments, such as the Foreign and Commonwealth Office (FCO) and the Department for Energy and Climate Change (DECC). Some of my colleagues have just worked up a new programme to bring in experts from other UK Government departments to provide on-demand advice on international issues and policies. This could include advice on tax, health and natural resource management, as well as climate change policy – whatever our partner governments most need. My view is that this will not only be good for partner governments – providing them with a wider range of specialists than ever before – but will also be good for DFID, by bringing us closer to UK policy so that we learn about successes and failures in action. By networking more closely with other departments and valuing their expertise, perhaps we will even help transfer the knowledge culture that permeates DFID to those other departments. If knowledge is the key to economic growth, as Eric Beinhocker believes (another one of our excellent speakers at the conference), we – along with Al Gore – will surely be taking the right steps.